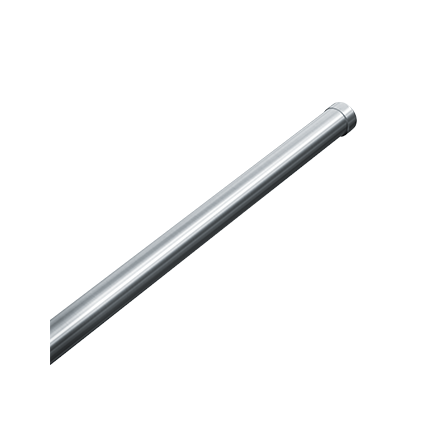 Rod is fabricated of alloy 18-8 stainless steel, type 304, No.20 gauge 1″ dia. tubing. Length as specified. Select length in inches (i.e. 48, 60, 120) to create Part Spec Order Number (i.e. 1224-60). Rod is installed in straight section between two (2) mounting flanges. Rods longer than 72″ (1829mm) require ceiling hanger Model No. 1224-C18. For use with standard shower curtain Model No’s 1200 or 1200-V having 72″ (1829mm) length and standard hooks Model No. 1200-SHU unit should be installed with rod centerline 74-1/2″ (1892mm) AFF or 67″ (1702mm) above tub rim to obtain 6″ (152mm) bottom overlap.